Hello I haven't been on here in a long long while . There used to be a topic . Fox attacks a list of what happened .I can't see this now . I see the forum has been revamped , is it still here . Yes I know people that have just had their first fox attacks .. is like it to be their last ..
Sandyyyyyyyyyyyyyyyyyyyyyyyyy! Gosh been quite a while! Glad to see you alive and kicking! I was Koojie all those years ago! Yes still here still got hens . Currently struggling to find ahimes for 2 boys i hatched . Just saying not breaking the rules trying on here. But due to that I'm in Facebook pages and the fox situations always scare me. 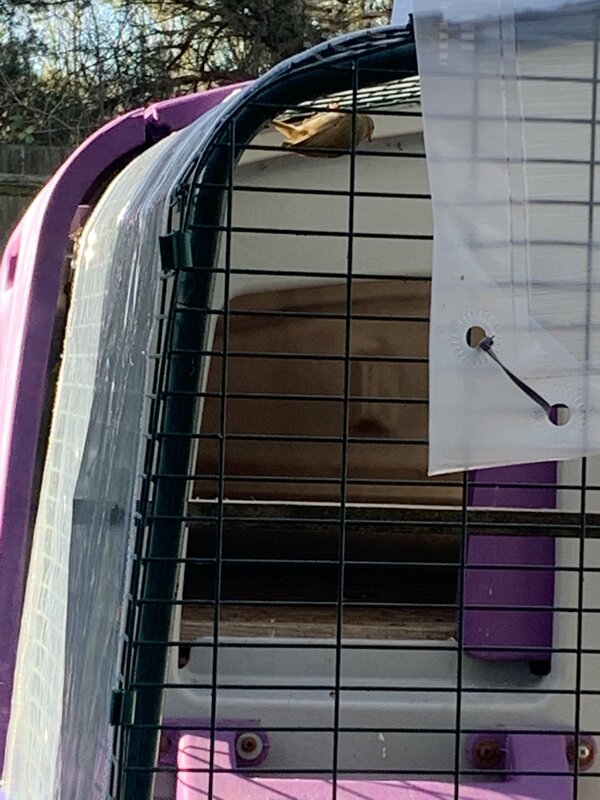 That thread was my Bible and it's easier to point people to reading that than just read what I'm saying ..
Then one boy of 3 I hatched with two rehomed ladies.... And the 2 big boys are in boarding . Runs have extended and bred lol . Numbers are down. My numbers went down - I thought we'd be down to zero by the time we moved, but they hung on and had to stay with Aunty Mostin for a while, sadly only one made it here but only lasted a few months. Long enough to enjoy fresh apples from the tree. Since then a couple of sad deaths with new babes in October, was rather devastating. But after MIL visited I was off picking up more chickens the day she went home. Therapy! Chicknboo mum hatched some birdies and I added more to the flock. Plenty of room here for more but we are inundated with eggs from 2 chickens and now a third has started! And yet I feel the need for more hens. Or maybe ducks later in the year. I rather fancy a cayuga or two! We are going to give some to our neighbours for allowing me to have a rooster, then our new friends across the way and down the road who don't have chickens - have had but been foxed, so gave up trying - like our neighbours, who also kept a rooster. I'm contemplating some more later - I've always wanted a faverolle but I miss my dark brown eggs so will be getting another maran and an araucana or two. Then I think the cubes will be full - and nest box wars will abound. Not only that, but when someone wants to lay early and wants to be alone, Trigger starts doodling just to draw attention that he can't stand this noisy hen any longer! I hate that they had so many fox visits that they had to stop. If foxes just killed to eat It would be easier but we lost 8/9 one night. I think in the wild the foxes don't get a chance to have such easy pickings, our birdies are just too tempting and they can't believe their luck. It's just the nature of the little beastie, but I do like them even so. Our friends have other farm animals that take up a lot of their time - plus lambing! The other people work, so possibly didn't have a secure pen? I'm tempting fate by letting mine range, but they do so while I'm outside and when I go in, then they have to go back behind the electric fence. If we go out for any length of time I keep them inside the run, inside the electric fence, so a little paranoid I am! There are a heck of a lot of rabbits here and I do see foxy poo with bunny fur! When we go to the supermarket we take a trolley and bags to take food home in.. The foxes don't have these . And they will come back and cache whTvrhey don't eat for later. Whilst we put in our freezer.. I too only ever have mine out when I am with them .putting them in secure Run when I go in even to the loo. When. I started keeping chooks I read each and every single fox attack what happened post. I looked at everything everywhere . Fox paranoia is the ONLY way to be. Fox AWARE.. .. I also asked fox Rescues for advice .. I always knew we had resident foxes .we see them all the time , so I needed to know all I can . I seem to remember you live in Surrey, Sandy. My son lives in Englefield Green and going home after babysitting one evening I saw the most magnificent fox at the end of their road. My daughter in law is thinking of having chickens so the precautions will need to be extensive! They are on the edge of Windsor Great Park so must be foxes galore. I’m in Oxfordshire on the edge of a market town. Our foxes are rural and generally stay in the countryside but you can never be complacent. Small world - I lived in Virginia Water, worked in Egham (after a horrid 2 year stint in London) and Englefield Green - the bank had a sub-branch there. Met OH in the bank and we had our wedding reception at the college. Pretty area. The outlaws live in Staines and we saw their road in Ali G's film - OH's school was featured too! Which is why Staines was renamed! Only saw foxes a couple of times. People up the road had badgers where they backed onto the woods, but never saw one. We did have an abundance of wildlife and I spent my early years lying on the lawn (cloud watching - some things never change apart from lying on the lawn) and hearing the skylarks - trying to spot them in the sky. Then they built a school on the field and that was that - no more skylarks. My folks did have a deer in the garden once. I also remember a lot of bullfinches in the forsythia - which was a stunning sight. I don't know where they went - I haven't seen bullfinches since. I remember the greengrocers! Used to buy things to take back to mum's! That would have been in the early 80s! Had my tonsils out in the cottage hospital there too! I used to work in Staines and sometimes spend my lunchtimes in Egham although usually I’d go for a walk down the Thames as our offices backed onto it. We live in Berkshire now but the Surrey and Hampshire borders are walking distance. We live opposite Swinley Forest which is lovely for walking but full of foxes. The road between our house and the forest is busy and quite a few foxes get killed on it each year so I know there are a lot in the area. We had a bold one visiting in day time and watching the patio door until a couple of years ago. My aunt lived in Winkfield Row before emigrating to Cyprus - where she refuses to speak anything other than English. Stupid woman. I was transferred to Ascot and there was a sub-branch in Sunninghill. We used to do lots of walks around there and further afield. When we moved to Hook and OH worked from home I was able to work part time in Wokingham for a mortgage company. We did like the swimming pool at Coral Reef - that was fun. I was born in Ashford hospital and lived just off the causeway in Staines until I was 5, my mum was born at Egham Hythe. Lol - my son was born in Ashford hospital too! My brother went to secondary school in Egham Hythe - I went to St John Bosco's in Chertsey, now the Salesian secondary, although no more nuns, and the M3 went right through our hockey pitches! I was a sort of St Trinian complete with hockey stick! Harrrrr! We lived in Staines when we first married and moved to Ashford. I used to walk to Virginia Water from there with my son in the pushchair. When OH came home from work he'd drive to my parents, we'd have dinner and bring us home later in the evening. I was quite thin then! Lots of foxes around Lyne - used to cycle to school! My son and daughter in law used to have an allotment in Virginia Water till children and work took over. I really like Englefield Green. Everyone is very friendly and there’s a lovely butcher there. My oldest granddaughter aged 6 goes to a lovely infant school and the little one is at a Montessori nursery so I’ve got to know the place quite well when I pick them up from school. The worst aspect of them living there is the M25 gets in the way! Just had to investigate - foxy barking/coughing/calling outside the living room window! Thought it was the tv, had to pause but no, it was here. Got the torch and it's gone. It came back but further down the field (not near the chickens - but if it did I hope it found the fence rather ouchie!) so ran upstairs with the torch and shone it out of the bedroom window, think I spotted it near the fence, so skipped into husband's study - promptly tripped over the shredder in the dark and emptied the contents into his slippers. Oopsie! my bad! Left a post-it not to say sorry - and emptied slippers as best, but there is now a little mountain of shreddings on the floor - will vacuum in the morning! Then you'll have to call it Arnie! Can't remember if I already said (senile moments increasing) but we saw two foxes trotting along the sheep field the other week and then again just one - always heading to the pub! They'd be disappointed, it doesn't open till late afternoon! We have a footpath that runs down the side of our garden and is about 5m from our bedroom. At 3 o clock this morning we were woken up by a vixen screaming her head off apparently running along the footpath - thankfully she was constantly screaming so I could hear that she was moving quickly and not stopping to investigate the girls (they were safely shut in their run but I’m still happier knowing Mrs Sox Fox isn’t actually trying to get in).